Before I begin, let me first say a little about myself. My name is Aaron Calidris. 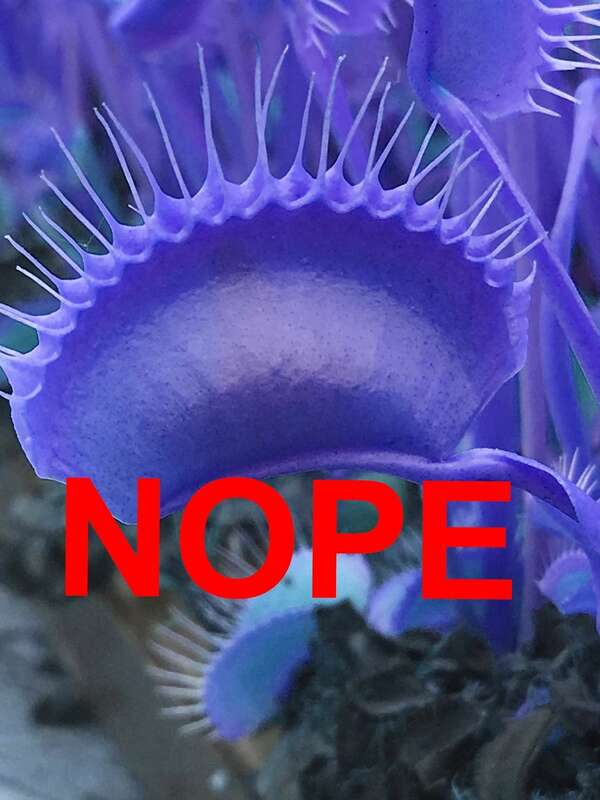 I’ve been asked to write about my adventures as a carnivorous plant enthusiast in southern Mississippi, and also how my being an out and proud gay guy affects those adventures. While my being gay and my love for carnivorous plants may not seem related, I think that the struggles one faces as a member of the LGBT+ community in the Deep South can definitely compare to the uniqueness and rarity of carnivorous plants, not to mention the often tiresome paths you have to walk to reach these beautiful places I talk about here in this post. Drosera brevifolia holding a rock. Carnivorous plants were almost commonplace where I grew up in South Mississippi. 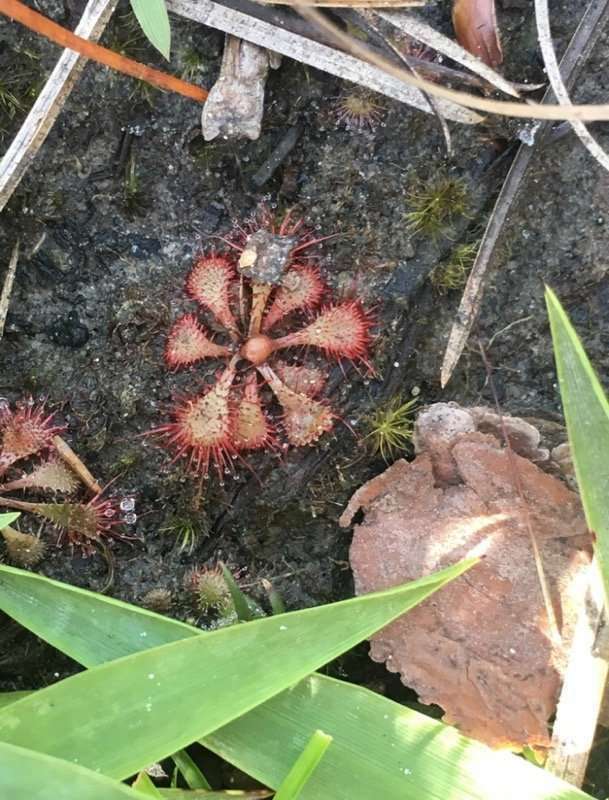 Asking my relatives about those tiny red plants growing on the lawn might be met with a “hell if I know,” or perhaps a brief explanation about how sundews grew out near the mailbox where the grass didn’t grow, and that supposedly they ate bugs. End of story. Although those sundews, Drosera brevifolia, were little more than a passing fancy for me growing up, I distinctly remember walking around stooped over to look for them among the blades of Bermuda grass.As a self-described naturalist slowly working his way towards a Bachelor’s of Biology, I discovered something unusually special and otherworldly in carnivorous plants. 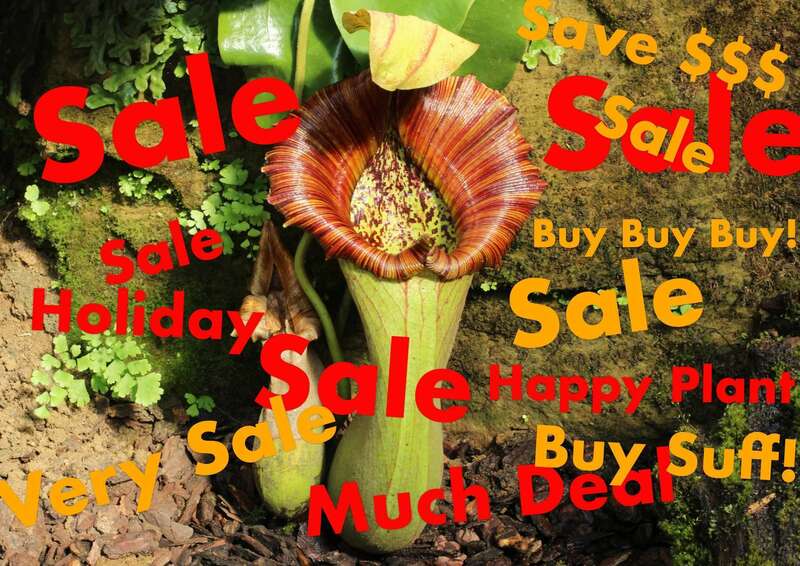 Their appeal for me seems to go beyond mere fascination to a feeling of kinship.Carnivorous plants are weird. They often grow in hard to reach places. To find the best locations, I often end up pushing and shoving my way through thickets of Smilax and Ilex that bar my path. To reach my destination I have to fight against forces that don’t want to see me succeed. Dense shrubs and vines make entering these bogs difficult and often painful. After reaching these wet savannas I often find myself treading carefully on logs and other debris that will hold my weight; dense layers of sphagnum and mud that may only be solid in appearance will often leave you sinking knee deep and attempting to crawl out of a hole. Once you get past those hurdles, you find plants that completely defy the norm. Modified leaves catch falling insects in pitfall traps. Sticky-leaved Drosera and Pinguicula trap weary insects who stop by for a rest. Lightning fast bladder-shaped traps of Utricularia capture tiny microinvertebrates in the swamp. As a gay guy living in South Mississippi, it’s no wonder why I am so fascinated with better understanding these unique plants, beautiful things whose very habitat is a challenge for most to love and appreciate. 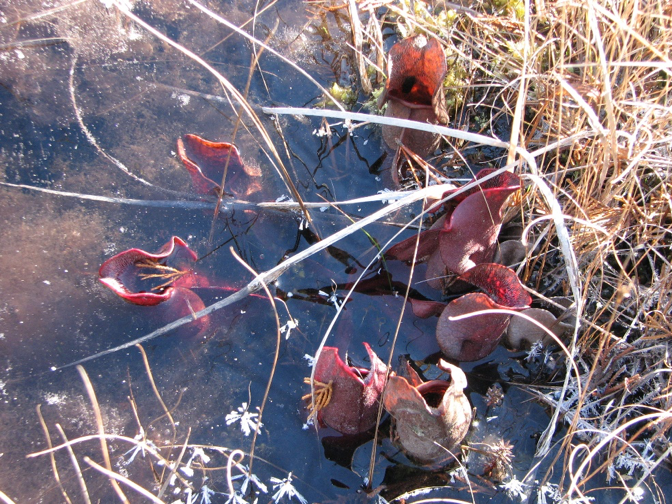 Carnivorous plant habitat in southern Mississippi. Flip back to me stooping over in a bog looking for rare plants. I’ve been searching for a while now for one of the rarest carnivorous plants in Mississippi, Pinguicula planifolia. I lamented the loss of such beautiful plants after having searched for this species at several extirpated sites without success. It has a very limited range on the Gulf coast, growing from the panhandle of Florida west to South Mississippi. It apparently has always been rare here, but fire suppression and the urbanization of what once was pristine savanna and wetland means P. planifolia is listed as an S2 species in the state. Being an S2 species means 5-20 known populations occur in Mississippi.A few days ago, I was headed to the beach to meet up with some friends, but they were going to be delayed. Having already left home, I decided to check my maps to see if there were any sites nearby that I had time to investigate on my way south. I’ve been marking places on my maps that I want to explore, sometimes visiting them, time permitting. Today, time was indeed permitting.As I approached the location, I once again found myself playing a game of Twister with every Ilex bush and Smilax vine in the treeline. Finally passing through my obstacles, I stepped into the bog. It was perfect. 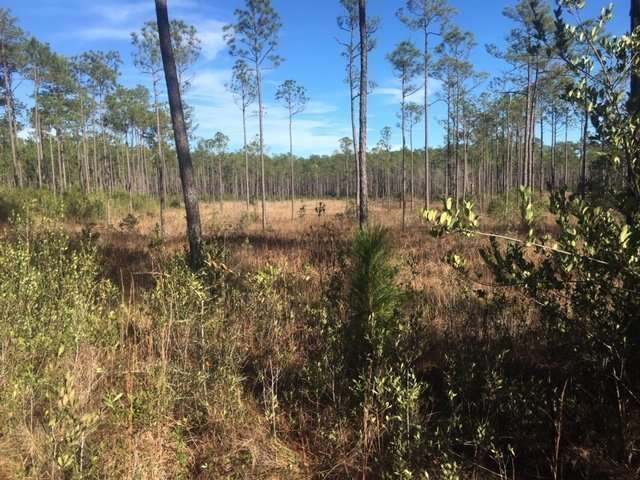 A combination of prescribed burns, hydrology and soil types contributed to create approximately 5 acres of wet savanna, wide open with very sparse shrubs and trees. I somehow knew this was it. 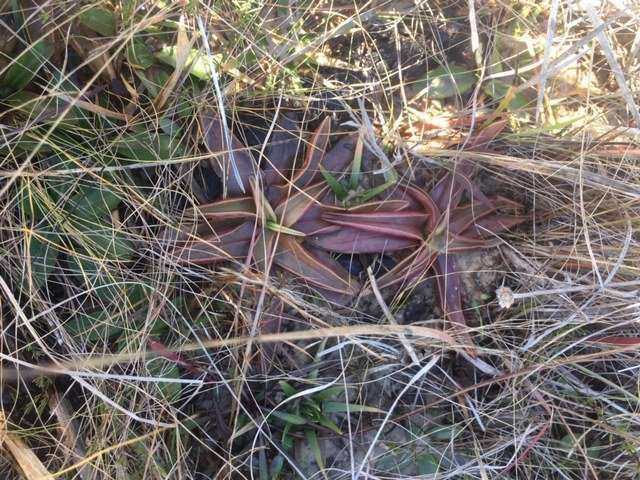 I slowly walked through the savanna and checked all open spots for any Pinguicula that might take advantage of bare soil to grow with less competition from other plants. At first, I thought I might be mistaken; I hadn’t found the plant I’d come here to find. But nevertheless, I persisted. The ruby-red leaves of Chapman’s Butterwort, Pinguicula planifolia. 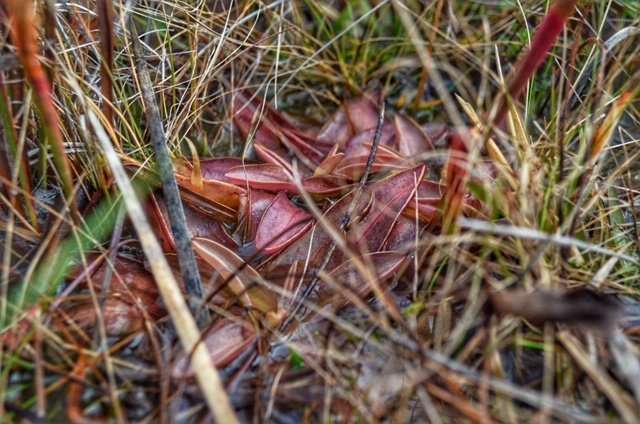 As I approached the far half of the bog, my eyes caught on something different, a leaf not quite like the others. It was my grail: Pinguicula planifolia, Chapman’s Butterwort. My hands shook, my heart raced, and I called my friends to tell them that I’d finally found the plant that had incensed my obsession. Hours spent panning over aerial images of the southern half of the state to find potential bogs that might be suitable, and plenty of nudging expert botanists and naturalists familiar with P. planifolia to help me better understand its biology finally panned out. I had found a very nice population of these beauties. After putting black marks on far too many locations and finding them utterly changed, or inaccessible on private land, it was so rewarding to finally see this plant in the wild. Pinguicula planifolia in-situ in South Mississippi. My quest isn’t finished by a long shot. 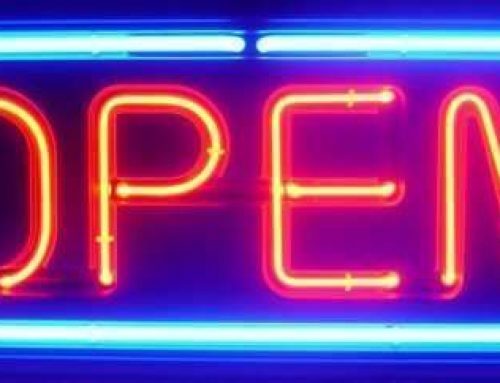 Coordinates from this site have been sent to botanists, who will help monitor and hopefully protect Pinguicula planifolia in the wild. I plan on continuing to search Southern Mississippi for more these weird and wonderful plants that live under most people’s radar, in hoping that I can help contribute to a better understanding of the present status of these rare plant communities. This post was written and all photographs taken by my friend Aaron Calidris. Aaron is a naturalist working toward a degree in botany, spending his off-time birding and locating rare flora in Mississippi’s beautiful wetlands. The content of this post was compiled, edited, and designed by me, Carson Trexler. Awesome stuff. Thank you for sharing, Aaron! Great work, Aaron. I’m looking forward to finding boggy areas to explore in the SE Pennsylvania area this year.